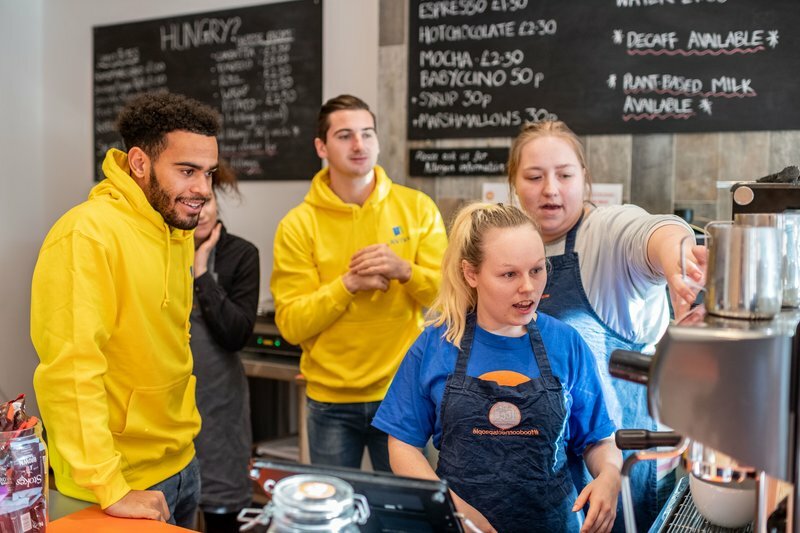 To celebrate the 550 UK projects receiving funding from this year’s Aviva Community Fund, Norwich City players Kenny McLean and Louis Thompson swapped the football training ground for a Norwich café that trains individuals who face a barrier to employment, The Feed on Prince of Wales Road. The Feed is a community café and training centre that helps people who have experienced homelessness, access training and employment opportunities. All profits from its social enterprise go towards assisting its trainees to help regain their confidence, through learning skills to work in the catering and hospitality industry. During the visit, the players and Aviva employee Danny Nobbs joined a session where attendees were taught barista and customer service skills – even learning the ropes themselves. The Aviva funding provides crucial support for local causes and projects that aim to boost the strength of communities in their areas. Now in its fourth year, the Aviva Community Fund saw 3,300 projects submitted with a hope of funding between £1,000 and £25,000. Project submitters called upon local supporters to champion projects, and an incredible four million votes were placed this year. To see which projects have received funding in your area, look here. The Feed will use the Aviva funding to purchase vital equipment for their training kitchen, which will enable them to double the number of individuals they can train and in turn increase employability for local residents. In addition to funding projects, Aviva has evolved its programme to provide ongoing support for all groups, not just those that secure funding. Kenny McLean said, “I really enjoyed visiting The Feed and seeing the inspiring work they do to train the people that attend. Louis Thompson, said, “We really enjoyed helping out for an afternoon at The Feed. It was great to see the hard work that goes on all year round from the coaching staff, meaning they can help others improve their employability. Lucy Webb, Fundraiser at The Feed says, “It was amazing to have Kenny and Louis join one of our training sessions. The players were naturals and we want them to know that if football doesn’t keep them too busy, there is always space for them on our barista team. Tom Daniell, UK Retail & Brand Director at Aviva says, “Each year, we are lucky enough to read through 1000’s of entries that show us the great work community groups across the country are doing. The Feed is an example of hundreds from Norwich and East Anglia that came forward, many of which were successful in receiving funding.